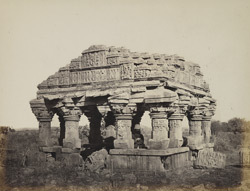 Photograph of a chhatri or pavilion at the entrance to the Vikia Vav, near Mukhana in Kathiawar, taken by James Burgess in 1874-75. Vikia Vav, situated near the ancient town of Ghumli, is one of the largest step-well in Gujarat that dates from the early 12th century, Solanki period. Stepwells are underground monuments which generally consist of a vertical well with a system of hauling up water by buckets; a stepped corridor of many storeys that reaches the water level of the well; and numerous pavilions in the stepped corridor.This view shows a chhatri or pavilion of the Vikia Vav. It has elaborately carved columns and brackets and balcony seating; the pyramidal roof have almost all collapsed. The well is reached through a long staircase.